Bob Anderson became interested in the banjo at a young age after seeing Eddy Peabody on The Tonight Show. When the movie Bonnie and Clyde hit the theaters a few years later and Flatt and Scruggs became household names, Bob was hooked. While studying art at Kent State University, Bob was assigned to a dorm room next door to a bluegrass banjo player who taught him how to play "Cripple Creek" and "Ballad of Jed Clampett". Soon after that, Bob was introduced to old time clawhammer-style music by Doug Unger, who was teaching an art class Bob was taking. 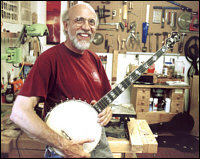 Doug's instrument-building inspired Bob and instilled in him the desire to build his own banjo. Over the next few years he built several more instruments, and even dabbled in both acoustic and electric guitars, before crossing paths with Doug Unger again. Bob was fortunate to be able to serve an apprenticeship with Doug, building three banjos during the apprenticeship. Now Bob's RM Anderson Banjos are being sold coast to coast and around the world. 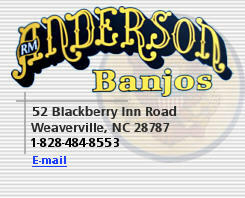 Please visit our images page to see pictures of some RM Anderson banjos. Bob Anderson will build the banjo you've always dreamed of owning, whether it's a traditional design or your own design, or give Bob a theme and he'll design the inlays and carving for your theme.